Induction Loop Systems have been around since 1937 when Joseph Poliakoff filed for a patent in the UK on an Induction Loop Hearing Assistance System featuring what was then called a telephone coil. Over the years, the telephone coil has been shortened to telecoil or just T Coil. Old it may be, but that doesn't make it any less a fantastic solution for people with hearing loss. You need a telecoil and if you already have one on your hearing aids, you need it turned on. Let's talk about why. A telecoil is an antenna for picking up transmissions from any induction loop system, it is basically a small coil inside your hearing aids. The coil works as a small receiver which picks up signals from a loop system that acts as an electromagnetic field. Any hearing aid with an activated telecoil can convert these transmissions into a sound signal. Where Can You Use Your Telecoil System? When you are choosing hearing aids you should consider a device with a telecoil system. Not all hearing aids have telecoils, so you need to consider it at the beginning. Generally, the smaller the hearing aid, the less of a chance it has a telecoil. So choose carefully, I think it is better to have one and not use it rather than want to use it and not have it. Well, it can be set up in such a way that only the signal from the loop system’s microphone is amplified, and background noise is shut out. That means that you can listen to just the transmitted sound, no interference. Ideal for you if you happen to be at church, in a lecture, in any public building like a Government Office or at the Theatre. Because all of these places tend to be difficult places to hear, but when you are in them, you tend to want to hear well. I mean this is the original wireless radio system, no streamers, no devices hanging around your neck, just clear audio straight into your hearing aids. you would be mad not to make sure you have one. There are basically two options for telecoil systems, they can be set up with just the streamed audio and with your hearing aid microphones turned off. Or, they can be set up with the streamed audio and your hearing aid mics turned on. The second option means that you won't be cut off from your surroundings. This is a pretty good solution for any situation where you might be with a companion, such as a theatre or the cinema. It is also a great solution for the lecture hall so that you may hear questions asked by the crowd. Your professional can also balance the inputs, so he or she can give you less of your microphones and more of the streamed audio. 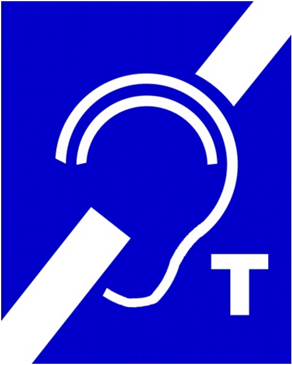 If your hearing aid has a telecoil system, your professional will need to activate it as a programme you can access. It is then as simple as you changing the programme when you need to. Honestly, this is pretty cool kit and with the advent of modern induction loop system, it is just getting better. You need the pleasure of the telecoil in your life! No streamers, no one knows you are using it, just crystal clear audio direct to your ears.